Do you have ancestry in Geelong? 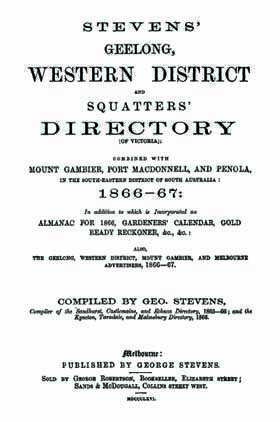 Geelong, Western Districts Directory (1866-1867 Stevens) is an extremely comprehensive directory of the western districts of Victoria including several areas in the south eastern corner of South Australia. It includes several separate sections of directories, general information and calendars. Street directories, alphabetical directories and commercial directories covering different places throughout the Victorian districts (as well as Mount Gambier, Port McDonnell and Penola in South Australia) are included. This directory is unique in that it contains a squatters’ directory, making it extremely useful to those interested in squatters in this region and also includes a travel guide. There is a significant section devoted to general information on different areas including Ararat, Beaufort, Belfast, Casterton, Colac, Coleraine, Digby, Geelong, Hamilton, Meredith and Portland, Skipton, Stawell, Steiglitz and Warrnambool. There are also directories covering mount Gambier, Port McDonnell and Penola. This is an invaluable genealogy tool for anyone exploring their Geelong family history or building a family tree.